The first (summer) edition will take place from 25th till 29th June, 2018. 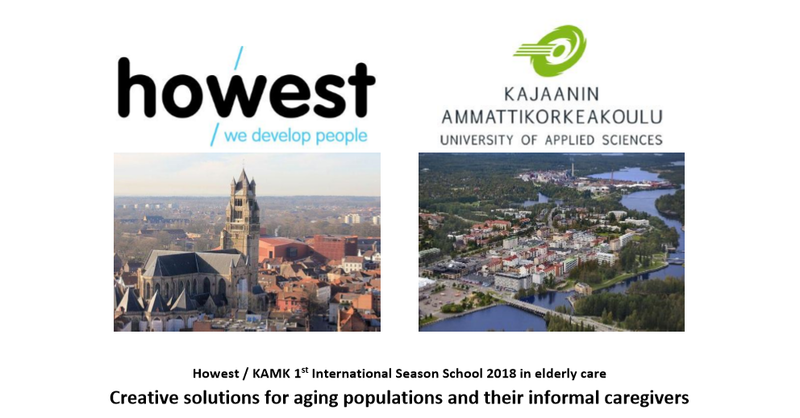 Since the academic year 2014-2015, a strategic partnership between Kajaani University of Applied Sciences (Kajaani, Finland) and Howest University of Applied Sciences (Bruges, Belgium) has been established. It was a great opportunity for both Nursing Departments from KAMK (Kajaanin Ammattikorkeakoulu) and Howest to share their expertise in innovating teaching strategies. The course combines innovative education and playful learning with recreational activities in the best parts of Kajaani during wintertime and in the best parts of Bruges during summertime. The course starts with a pre-reading assignment, followed by key theories, tools and concepts within the framework of creative solutions for aging populations and their informal caregivers. The following 1-week on campus course includes intense group and case work. As part of the final assessment, a poster presentation on Friday is included (see schedule below). Bachelor in Nursing students, teachers and professional nurses are the main target group. Secondary, other paramedic (bachelor) students, teachers and professionals (occupational therapy, applied health sciences, applied psychology, social work) can join/contribute to the event as well. On the Friday, there will be a poster presentation, prepared by mixed teams of students and assessed by the teachers. Students can pass or fail, but a constructive collaboration will be rewarded with a pass. Soon, there will be an online registration link. Deadline for registration is Thursday 31th May 2018. All participants have to manage their own accommodation and travel costs. We will ask the Nursing students from Howest – especially those who will be attending the Season School – if they are willing to host the foreign students. The first Summer Edition of the Season School (25 – 29th June 2018) will take place in Howest, campus Rijselstraat (address: Rijselstraat 5, 8000 Bruges). More detailed information on the Summer Edition will be published soon on the website of Howest. More detailed information on the Winter Edition will be published soon on the website of KAMK.